One of the most modern museums in the governorate of Dhamār, built in 2006 to fulfil the educational and training needs of students of archaeology within the Faculty of Arts, the Dhamār University Museum contains a collection of valuable ancient artefacts. This Museum distinguishes itself for the great variety of artefacts of South Arabian culture, like funerary stelae, sculptures, incense burners, fragments of capital with decorations of grape leaves and bunches of grapes with mythological figures, pottery. Two small stelae are particularly interesting for the subject represented: the first bears the figure of a mythical animal with plumed wings, a raised forepaw, upright tail, thick mane and long ears, perhaps a horn. The second stela is quite mysterious: it represents a human face on the top of a palm tree as if it were part of the vegetal element. 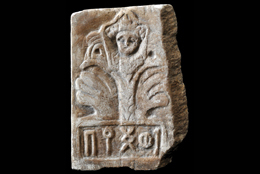 The museum houses a few objects from Ẓafār dating back to the Ḥimyarite period: among those, a slab with the symbol of the Ḥimyarite royal dynasty and a fragment of alabaster with monogram. The inscribed objects are about 25, among which there is a text written in minuscule script but engraved on stone, instead of the usual wooden sticks. Like the Regional Museum, the University Museum was inventoried by the CASIS project in November 2007 and July 2009. Photos are courtesy of the Dhamār University Museum.